HP ENVY Recline 27-k151 is a sophisticated 27 inch All-in-One desktop computer with a functional and versatile 10-point touchscreen- something you can use on your desk or even on your lap despite its heavy size, the way it is designed it can conveniently turn into a large tablet with touch navigation close to your lap or on your desk- can be used in four different positions, giving you different options to interact with its totally adjustable screen that can be tilted between 5 and 145 degrees. With the 4th generation Intel i5 processor and 8GB RAM, it has enough power for both work and play, a beautiful Full HD IPS display and very decent sound with Beats Audio. HP ENVY Recline 27 comes with the dual core Haswell Intel i5-4570T (4 MB Intel Smart cache) processor with turbo boost that takes the speed from 2.9GHz base to 3.6GHz max and hyper threading function for dual cores to handle four threads in parallel, 8GB DDR3 SDRAM for superior multitasking, a hybrid drive of 1TB Serial ATA HDD at 5400rpm rotating speed and 8GB Solid State Drive to help it boot up or wake up from hibernation quickly- don’t expect it to be like a larger capacity ‘128GB or so’ SSD and Windows 8.1 operating system which you’ll be able to upgrade to Win 10 for free soon. The Intel i5-4570T processor has a Passmark benchmark score of 4857 on this review day and a Thermal Design Power of 35 watts. 27 inch LED-backlit Full HD IPS touch display with 1920 x 1080 pixel resolution offers crisp and sharp images with vivid colours and wider viewing angles which is an important feature especially given the design of this machine- how you will use it tilted at different angles so it is a great screen to watch movies or play games on with friends and family and the 10-point touch function seems to work well- is very responsive. Graphics card is the NVIDIA GeForce GT 730A and it performs close to higher end integrated Intel HD cards- a bit better than Intel HD 5000 so older games are playable at higher settings but newer titles at low to medium settings but offers enhanced realism for multimedia and games and fast playback, great for streaming and watching movies and editing multimedia up to a certain level and you also have the built-in Intel HD 4600 as part of the/with shared memory with the Intel i5 CPU. You’ll experience crisp, clear and immersive sound through the built-in stereo speakers and Beats Audio when you’re listening to songs, watching videos or playing games. HP Envy Recline weighs 32.2 pounds and measures 19.20 x 10.40 x 25.80 inches- it is neither lightweight nor compact in size so you can’t keep taking it from room to room and you need a fixed space for it on your desk. Wireless keyboard with 10 key numeric pad and volume control and a wireless optical mouse are included in the bundle (as well as the batteries). It doesn’t have an optical drive but a 802.11bgn wireless, Gigabit Ethernet with RJ-45 connectivity, 2 x USB 3.0 ports to transfer data faster, 2 x USB 2.0 ports, 3-in-1 Memory Card Reader, Bluetooth 4.0, NFC Antenna, an HDMI port to hook up your game console, large screen HDTV and Blu-Ray, a Headphone/Mic combo and a good quality 1 MP webcam for Skype chats with friends and family. It is not mountable on a wall- no VESA mounting points at the back and you’ll need to use it on the flexible base provided- tilted between 5 and 145 degrees. 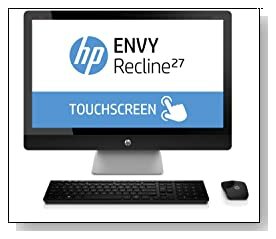 Conclusion: HP ENVY Recline 27-k151 seems to be very easy to set-up and use as one of the customers pointed out it can be ready to browse the internet within 5 to 10 minutes of taking it out of its box and we like that it doesn’t come with any of the unnecessary trial software that you would need to uninstall like on other machines. Considering it has such robust specs and features- a premium good-looking design, a 27 inch fully functioning and responsive beautiful touchscreen, a powerful Intel i5 processor, 8GB memory, 1TB HDD + 8 GB SSD storage, seems to be really affordable for all that you’re getting. Using Windows 8.1 is not much fun for many customers but firstly this is a 10-point touchscreen computer and this makes things easier and secondly Windows 10 will be launched soon in 2015. Wireless connection is not the faster 802.11ac but the regular 802.11bgn and is still fast enough- judging by customer reviews and it is quite a heavy unit which is partly because of the extra large screen. Despite its small drawbacks it has many more advantages over competitor All-in-One machines and at this price level it really is unbeatable- remember that AIO desktops tend to be more expensive than normal. 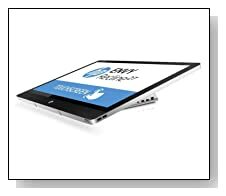 If you need assistance with anything or experience any problems, you have the HP Customer Support which you can reach through phone, email or live chat and they seem to be quite helpful.